We have been taught in schools in different ways, teachers used various visual aids, gestures with nursery rhymes and so on. As we grew we had PowerPoint presentations for better understanding. But most of the time one teacher is assigned to each subject and she would be teaching us as mentioned in the course book. Majorly the conversation is limited. Only the teacher speaks and the student listens. A normal lecture is of 45 mins, but do you know the average attention span of humans is not more than 5 minutes. Moreover, it is a proven fact that humans have nearly 45- 50 thoughts in a minute. You might evaluate from this, how distracted we are, how ineffective the learning is. Every now and then teachers have been inventing ways to make students understand things better. But until and unless there is active participation from a student, he won’t have effective learning. For this reason, team teaching is found to be very effective as it involves students actively. It involves mental and physical simulation of students. As the name suggests it is a group of teachers, working as a team and teaching. The team can range from 2 to 5 teachers who will teach the same group of students. The different type of teaching may include- Teaching the same group at the same time, shared teaching as per the area of expertise or teaching different subgroup within a large group of students. The team teaching method is one of the greatest innovation in the teaching sector. It came into existence in the year 1954 in the USA and was mainly focussed on developing courses and teaching strategies. Team teaching is also known as collaborative teaching or co-teaching method. 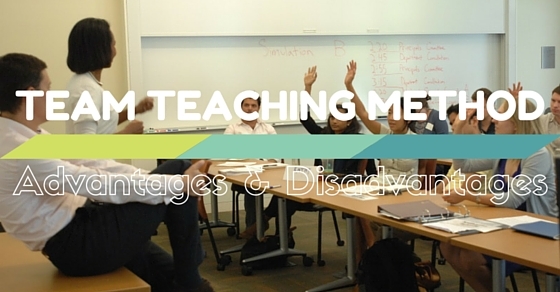 The definitions to team teaching is defined by different people in different ways. “Team teaching is a type of instructional organization involving teaching personnel and the students assigned to them in which two or more teachers are given responsibility, looking together, for all or a significant part of the instruction for some group students”. – as per Spanish. This type of team teaching method is just similar to a pyramid where different levels of teachers are organized in a structure from top to bottom. The team leader is placed at the top, mid-level teachers just below the team leader and normal teachers at the bottom. In this type of teaching method, there is no differentiation between teachers. Through the cooperation of two or more teachers working together, synergetic team teaching groups can be formed. Co-teaching or team teaching is basically a collective understanding of two or more teachers focusing on a single group of students with the best use of strategies, methodology and joint accountability. The team teaching method is practised mainly at a single classroom or space and its developed so as to improvise the learning strategies for the students. 1. Improve the quality of the instructions provided. 2. Effective teaching methods as per the interests of the pupils. 3. Make the best usage of abilities, interests and expertise in the teacher’s community. One can get an efficient form of learning at a very low cost; as such no new resources are required to start team teaching. Many a time, teachers are overburdened with the fact that they have to complete the curriculum by the end of the term, even if they have creative ideas to teach students they do not have enough time to plan and impart the same to the students. Moreover, it can also happen that teachers have ideas but need guidance to develop the skill and impart the same to the students. Team teaching eliminates such problems and other problems of a similar kind. When teachers collaborate they could play on their strengths and weaknesses and together as a team can make a successful way to teach and learn. Very often teachers in schools and colleges lack bonding and friendship among themselves. Even worse a competitive environment is seen among the teachers. The main motive of educational institutes is to impart value to students and work as a whole for being efficient knowledge importers. Envy or competition among teachers can have a negative impact on the Institute and on the student’s mind. A new method is always appealing; students might wonder what new thing they are going to learn. A team of teacher will have various ways and ideas to put forth, which make the students, put on their thinking cap and question ‘why’ for all things. They will come up with various questions, queries and ideas. In traditional lecture only one teacher is teaching, the ideas, thoughts are only one way. Often students are forced to accept whatever taught and they do not bother to think the other way around. Team teaching helps them question the theories and facts. When the students are totally involved it brings out the creativity and the habit of questioning things. Let’s be very honest, in lectures, we are often distracted, either chatting with our friends or checking our phones. Or maybe jotting down notes, in all the mentioned cases we are giving divided attention. An interactive session, debates, help of visual aids and the like evokes interests among students. Team teaching exactly does that. Humans bond when they interact, it is as simple as that. The bonding is increased when teachers often ask questions and listen to what students have to say. People when heard and appreciated, will ultimately be more engaged. Teachers will often find students who rarely participate in any activity and are aloof, mostly students with a shy personality will not speak much in class. But during team teaching a variety of ideas are put forth. When students see the way teachers work in team, they indirectly get the lesson of team management and the importance of working in a team. Everyone in their career will need to work in teams. Students get to see how teachers capitalize on each of their strengths how they respect each other’s ideas and how as a whole they put the best picture forward. Indirectly, team teaching is helping reduce the extra lecture of team management. Students interaction and logic is improved drastically as they learn to question things and learn how to communicate their ideas effectively. While in case of a debate, students get to learn how to respect the contradicting ideas, accept them and also tell their own thoughts in return. When a teacher is teaching solely, he or she cannot give attention to the students who have a problem learning. The main focus is to make the whole group of student understanding at the same time. But we all know that all students are different and everyone has their own learning pace. In team teaching, if one teacher is speaking the other one can solve the queries student raises, without disturbing the whole class. There is no limit to learning, provided if one wishes to, team teaching gives teachers an opportunity to learn and grow themselves. Teachers also get a chance to brush up their skills, work up to their fullest potential and along with that their creativity, motivation and team management skills get a solid boast too. Let’s face it, we humans dislike change, Teachers may not accept the idea of team teaching, they are often rigid and want to stick to the traditional teaching techniques. The idea that they will have to put extra effort and work hard makes them reluctant. Team teaching can only be effective if teachers are willing and happy to involve in the new form of teaching. A forced approach is bound to fail. While traditional teaching has been an attempted and tried technique, likewise it has disadvantages of traditional teaching, especially nowadays the innovation has improved adapting, more fun and intelligent. Apart from accepting the change in the form of teaching, teachers often have the rigidity to accept and adjust with other teachers, while working in a team we have to accept others idea and drop ours. Teachers should not have an ego and should handle criticism openly. Internal coordination and good team tempo is extremely important, internal conflict may result to a complete failure. People with contradicting personality must devise a way to work together effectively. A dominating person will overpower other people, a collaborative approach will help everyone grow and devise an effective process of team teaching. While devising creative curriculum & engaging students in an interactive session, the curriculum may fall behind. Though creative teaching is necessary, it is also important for completing the course syllabus. This is one of the major challenges faced during team teaching. Teachers have to take out time from their busy schedules and sit together to devise the lecture flow and activities that have to be carried out. The sessions at times can get super interactive and teachers will forget the link. The teachers have shared responsibility and have an individual role to play. If anyone of the teachers is absent for some reason then the whole session will be jeopardized. Teachers will have to refer many books and talk to several veteran teachers for designing an effective teaching plan. It will also involve deep research and planning out activities which will be appealing to students. Thus it takes lots of time and efforts before even starting a session. While being creative and lining up too many activities, it could get way beyond the required amount. A little simulation to students brain will bring the best in them, but if it gets too much they will find it too hard to comprehend. One needs to find the right amount. Since childhood, students get used to the traditional form of teaching, they like the structure and the repetitiveness of the lectures. Most probably they have devised their own ways to make it work, a sudden change in the style of teaching will make them confused and they might resist the change. Some Students like the basic lecture and then they do their self-study to learn in deep about it. You could find students coming up with specific problems that they find difficult. Teaching them everything in detail and inculcating activity, debate or different methods to teach the same topic may make them feel that their time is getting wasted. This new teaching style is fresh to students as well as teachers. Teachers would not have perfect coordination at the first go, they will have to do many trails for reaching a most effective format. There can be an overlap of ideas among teachers or they could not impart whatever they thought of. It could also happen that they overestimated or underestimated the time required to complete the planned tasks. If one of the teachers finds it too difficult to carry out and opts out of it then the whole team will be disrupted. If we compare the efforts required for teaching solely with the efforts required to teach in a team, then the later one is undoubtedly much harder and would require deep study, time and planning. Thus teachers may demand a higher salary. It could ultimately bring financial pressure on the educational institute. 1. A team of teachers with various set of skills prospective and expertise. 2. Vision and sense of direction. 3. Ability to coordinate internally. 5. Friendly nature and ability to keep the environment conducive. 1. The openness of mind- Teachers and students must be open to change and must embrace this new form of learning. 2. An effective strategy is necessary which requires undivided attention and time, willingness to make the learning effective. The strategy should involve coverage of course syllabus, activities and quizzes to be carried out, a flow of lecture and documenting and developing a database of the same. 3. Regular meetings and follow up. 4. Rotation of roles to enhance learning and reduce boredom. 5. An effective way to assess students performance. 7. Training to new teachers who are new to the concept of team teaching. Let’s say that your college has 4 teachers who teach sociology. Here each teacher will be teaching a few sections to your class. The sections or topics of the whole subject will be divided by the teachers themselves. The senior most teacher will be the team leader of the whole process. We can see the advantages outweighs the disadvantages if done properly team teaching can be an effective tool for successful learning. Though it requires a lot of efforts and coordination, it promotes overall growth and development for teachers and for students.